DC Envelope Printer Doc v 2.0 - Basic Application - Douglas Computing, Inc. Basic Application online help tutorial. By default, when you open the DC Envelope Printer, you open the Main page of the app. On the page is displayed a What You See Is What You Get (WYSIWYG) image of the envelope you are going to print. To print an envelope quickly, look below the envelope image, to determine the size of the envelope to which the DC Envelope Printer is ready to print. If you would like to print to an envelope of another size, access the bottom menu bar on the Main page of the app, and click on the Configure button. Click on the Envelope Size button to the left on the resultant app page, and then select the envelope size you want. Click on the Apply button to apply your selection to the envelope image on the main page. 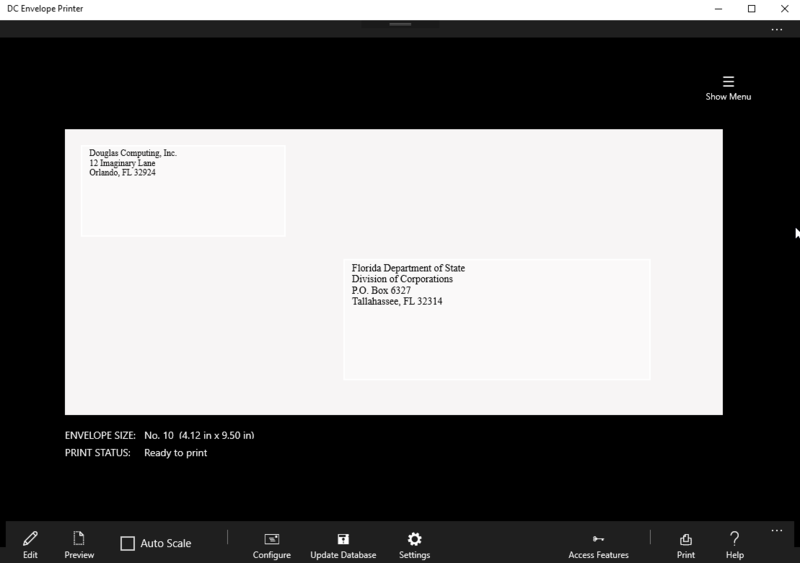 After you are satisfied with the size envelope to which the DC Envelope Printer is ready to print, enter a return address directly into the text box, in the upper left corner of the envelope image. Next, enter an address directly into the text box, in the middle of the envelope image. Now you can go ahead and print your envelope. To change the font and font size of the return address and address on an envelope, you must first add at least one return address record, and one address record, to the DC Envelope printer's database. Next, you must configure your envelope. Afterwards, you may print your envelope.